Childs clarifies that he is only interested in the rehabilitation of Central Park as a citizen. He would be pleased to visit Berry when he is in the South. 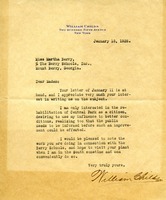 Berry endorses in Childs's proposal to formalize the landscape of Central Park and invites him to visit Berry, where he will find great natural beauty.